CHELINK Audio Bluetooth Adapter for MMI 3G, It is a plug-and-play wireless Bluetooth music adapter designed for Mercedes Benz. Activate the AUX mode in the MMI system and connect your smartphone with this bluetooth adapter, then you can listen music via the car stereo. Only Compatible with MMI 3G Cars 2009-2011 for which MMI can generate power, NOT Compatible with MMI 2G or MMI 3G Plus or other MMI Generations. 1. Open MMI system and switch to "Media "
Notice: Some MMI system may not support USB function, so it can not play USB flash via this cable. 4. Bluetooth v4.0 with EDR. 1. Play USB flash musics via OEM car MMI /MDI media system. 2. Display song info and control tracks via OEM MMI /MDI system. 3. Charge smart phone via USB connection. Bluetooth Music Streaming for Mercedes Media Interface. 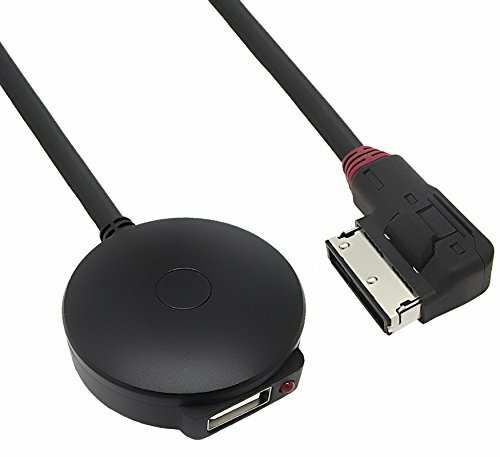 Activate the AUX mode in the MMI system and connect your smartphone with this bluetooth cable, then you can listen music via the car stereo. The bluetooth cable will automatically connect to your smartphone when the car is started. Simultaneous connection with two smartphones is supported. Press the button to change between the USB mode and the bluetooth mode. Insert the charging cable into the USB port for charging, or insert USB flash stick for music. Please note that you can only change songs from the smartphone, no control over music from the MMI system. The playlist will not be displayed on the screen. If you have any questions about this product by CHELINK, contact us by completing and submitting the form below. If you are looking for a specif part number, please include it with your message.